Part the 4th of the DR In Memoriam sketch dump, starring Kimagazaki Gantetsu as the "loudmouth in orange," Watarimono Mihato as "the elegant sword mistress" and Lee Yuuga as "the gentle fang of youth!" As said in previous ones, Comment and make suggestions if you like, but keep any pairbashing to yourselves, please. 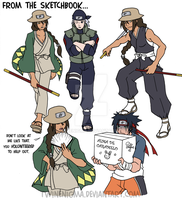 Top row - Gantetsu, the loudmouth stubborn hokage-wannabe. The will of fire is strong in this one. His family name is Kimagazaki. Middle row - Mihato, the pretty, deadly sword mistress. She uses wind and water elemental jutsu and likes movies, particularly the Adventures of Princess Fuun. She has a wish to become strong to protect what is precious to her. Bottom row - Yuuga, the brawling vet, middle child of Hana Inuzuka and Rock Lee (the tale of their meeting involves an injured squirrel and is practically a village epic in the weird-hookups category) and, ironically, the most level-headed and sedate of the whole team. She's the one usually knocking sense into Gantetsu and keeping Mihato from getting them kicked out of the cinema. You weren't expecting THAT pairing, now were you? Looks kinda like hinata ? and i want that wolf!! <3 love. The middle Inuzuka. The hair and headband. I think. How do you come up with names? Cause I am having the hardest time naming ShikaTema's Daughter. I look up a bunch of them and usually fuss over them for a few hours, leave it alone, come back and then fuss some more. There's always one that sounds right and that's the one that usually I go with. Well I figured a good one out anyways, Now I'm fussing over whether Lee is his Personal Name or His Family Name. AAAHHHH the horror. Yeah but they always refer to him as "Lee" I think I'm going to go with that anyway because the son I gave him. I thought it be hilarious to have the Male Spawn of a Lee/TenTen Pairing be named Jetsu Lee. I really love Mihato. ^^ She's great! Yeah, she's really pretty and fun to draw. 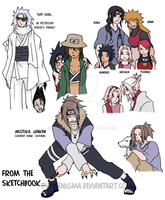 love her dog though and these oc konoha people are awesome! Thanks! I enjoy drawing them. Probably why I'm up to five parts in this sketch dump series. So far, it hasn't occurred to anyone on fanfiction.net either, lol. silly people..they should start listening to your awesomeness! Nah, it's good to be able to say you've done something different. Thank God she inherited her mother's good looks and none of Lee's. But I bet she has Lee's kind heart. 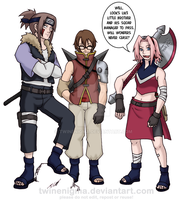 Lee and Kiba's SISTER!?!?! Seriously I DID NOT SEE THIS COMING! OUT OF LEFT FIELD AND THEN SOME WITH THAT PAIRING. awww... cool!!! whaaat??? Hana and Lee???? hahaha i really wasn't expecting this!! i like gantetsu really much.. he looks to me like a kind of hot spirited guy.. kinda like Naruto.. i really like him!!! Gantetsu is a great guy - of course, he's a hero - he's wearing orange! and right again!! orange is for heros!!!! yaaay for orange! i doth crush on the guy in orange. he growith up to go bare chested and hath purple eyes. *stops attempting old english* he seems like a great guy to hug. i wanna hug him very much. gah, i already love his character, he just seems so damn likeable, like naruto! Mihato looks so intense older, and she has a really nice style that mixes chinese and japanese somehow. or at least that's my impression of her. when i saw you had posted another sketch dump i went YAYS! really loud and now even i think i'm weird. :3 Gantetsu is pretty darn cute! 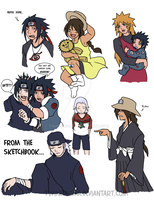 xD I think Naruto pretty much already has him pegged as the potential 8th, mainly cause Gan reminds him of himself as a kid. Mihato - ehhhhhh... I was watching a mini-documentary on a Chinese studio that made a lot of those epic martial arts movies. It shows. Mihato is one of my favourites to draw. She's so elegant. Yuuga is kind of a stick in the mud compared to her siblings and teammates. Would you believe I'm most likely the first to ever ship that couple at all? I wonder how many people now have this frightening image of Lee asking Hana to heal his youthful squirrel friend and giving her the shiny puppy dog eyes, lol. :B There's another one or two coming soon. I just had a lot of work to do this week. TELL me about it! i have a TON of work to do that i actually had to go home because the dorms were too damn noisy for me to get any of the MOUNTAIN of wirk done that i have to do by monday. and i REALLY wanna earn my paycheck this week. These are totally hot characters! Never watched Samurai Champloo. :B Thanks!